Jolada rotti is an unleavened Indian bread made out of jowar (sorghum), originating from North Karnataka. It is coarser than a roti. It can be either soft or hard in texture, compared to a khakhra or cracker with respect to hardness. The name literally translates into sorghum bread, jolada rotti is also called as jwarichi Bhakri in neighboring Maharashtra. Jolada rotti is part of the staple diet of most of the districts of North Karnataka, where it is eaten with pulse curries such as jhunka, enne gai or with assorted chutneys. To knead the dough of gluten free flour such as jowar, bajra, rice, we use warm water. Once dough is ready, try to cook roti immediately or you can knead the dough into small portion. Otherwise dough will release the moisture and would tough to handle that. For 10th day of BM#92Edition, My Letter is J and J se Jowar Bhakri/ Jowar Roti. 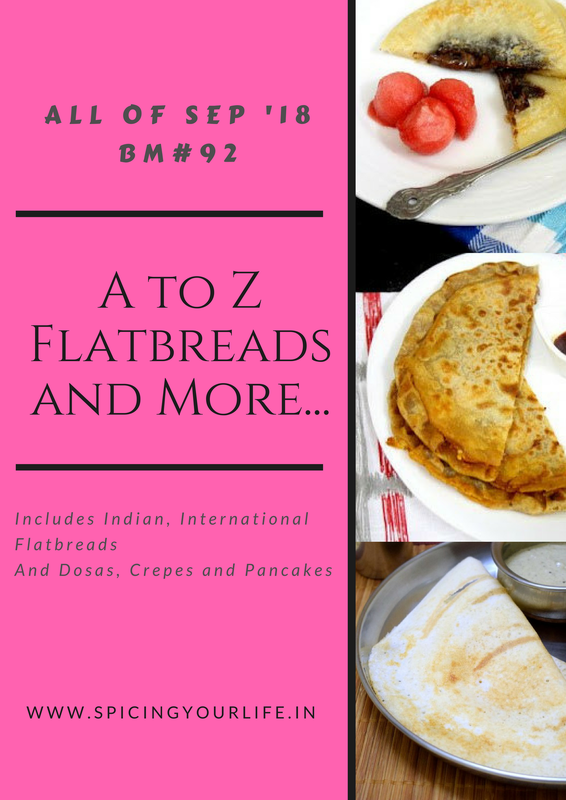 Check out my other Indian Flatbread recipe such as Pol Roti, Tawa Tandori Roti, Banana Poori and Boondi Paratha. Combine jowar flour, salt and add warm water slowly to knead the flour. Keep aside for 5 minutes to set and again knead it. Heat the tawa on medium flame. Divide the dough into 5-6 equal portions. Roll it by using little wheat flour and roll in round shape. Dust off the extra flour from the roti. Place them on hot tawa one by one, turn it over after lower side is cooked. Now spread water over the roti with help of hand to remove excess dough. Cook the roti on a low flame till to both sides turn brown and cooked. Spread the ghee or butter and serve it with chutney or curries. Jolada rotti is an unleavened Indian bread made out of jowar (sorghum), originating from North Karnataka. It is coarser than a roti. Combine jowar flour, salt and add warm water slowly to knead the flour. Keep aside for 5 minutes to set and again knead it. Divide the dough into 5-6 equal portions. Heat the tawa on medium flame. Roll it by using little wheat flour and roll in round shape. Dust off the extra flour from the roti. Place them on hot tawa one by one, turn it over after lower side is cooked. Now spread water over the roti with help of hand to remove excess dough. Cook the roti on a low flame till to both sides turn brown and cooked. Spread the ghee or butter and serve it with chutney or curries. Rolling jowar bhakri is seriously an art and you have got them with prefect shapes. Kudos to you Preeti. Jolada roti with some chilly pickle will definitely please my tastebuds. Perfectly made, Preeti. Love jowar roti in any form. Hi Ritu.. I purchase from small local flour shop, plus I dust my chapati with wheat flour, there are big difference between local shop flour texture and packet flour. It is interesting to see the whole grains being used more and more and I want to start making use of them more often in our every day diet. The Jowar bhakri looks amazing and love the texture. Perfectly make jowar roti as rolling it is very difficult. To roll it more easily I sometimes add some boiled and mashed potato. I too made the same one Preeti but with a few veggies added to the dough.You have rolled them out perfectly! You have got a perfectly rolled out rotis. Great job there! These rotis taste awesome even when cold. jolada roti was in my list too to make but did not find the flour in store. looks great and perfectly cooked.